In a blender, combine cilantro, lime juice, and oil; season with salt and pepper. Blend until smooth. In a large bowl combine, cabbage, bell pepper, and scallions; season with salt and pepper. In another large bowl, toss lettuce with ¾ cup dressing. 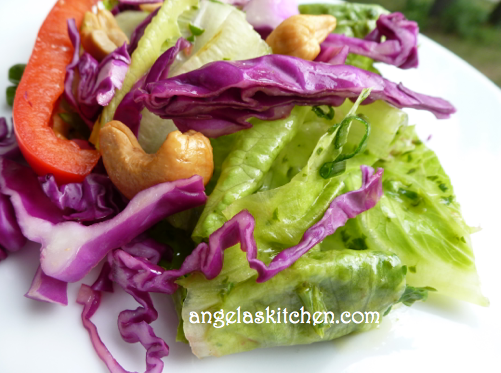 Top with cabbage mix. Drizzle all with remaining dressing, and sprinkle with cashews.